Bantuan Rakyat 1Malaysia was one of the main excuses Mahathir Mohamad had given when he started gunning for Najib Razak in 2015. He called it a form of corruption. Since then BR1M had been lynched and its recipients were shamed and told that there were receiving "dedak" from the Najib Administration. Najib was accused of bribing his way to get the people's support and of draining the nation's coffers in the process. In the run-up to the PRU14, even Mokhzani, the usually low-profiled son of Mahathir, and one of the wealthiest persons in Malaysia, got tangled up when he made perhaps one of the most seething insults on BR1M and its 7-odd million recipients. 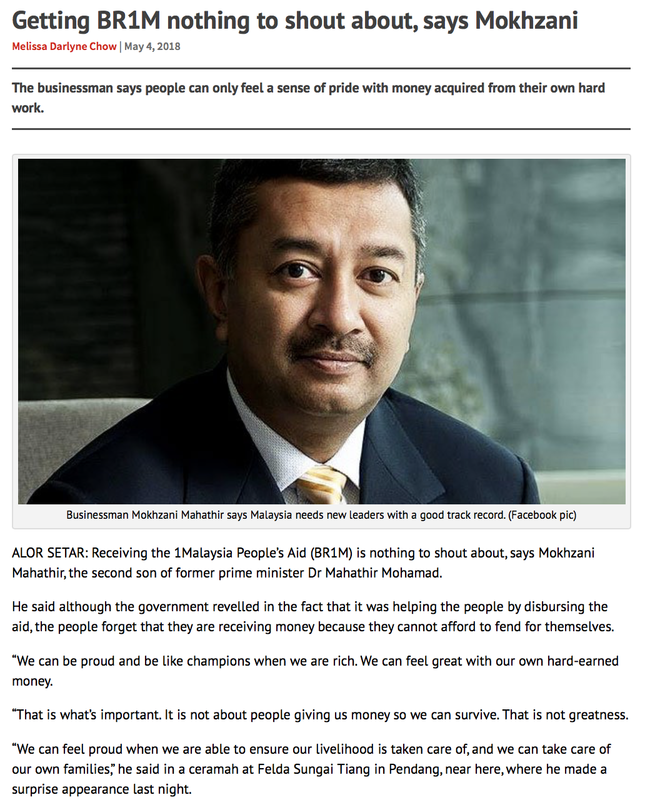 Read Getting BR1M nothing to shout about, says Mokhzani; Vell Paari slams Mokhzani for "disrespecting" BR1M recipients. Today the scandal-ridden Finance Minister Lim Guan Eng confirmed that the Government is keeping BR1M but will be calling it BSH, or Bantuan Sara Hidup. The first BSH payout will cost the Government RM1.6 billion and benefit 4.1 million people. Alhamdulillah! And Thank You, Najib Razak. "The first BSH payout will cost the Government RM1.6 billion and benefit 4.1 million people. Alhamdulillah! And Thank You, Najib Razak." "The 1MDB theft alone cost the people RM20 billion and benefited Jibby, Rosie, Jho, Riza, 192 KBU and a few assorted hangers-on *cough cough*. Alhamdulillah! And Thank You, Najib Razak." If you're interested, Latuk, that sum stolen from 1MDB would cover 12.5 rounds of BSH. But we need to do our patriotic duty, because no woman should live on 284 Birkin & Hermes handbags alone. Aiseyman....lama rasanya tak dengar berita...sihatt !!! BR1M benifitted more than 7 million people compare to just 4 million people now. 50 days and your money hasnt run out...not bad. Thick skin/wall face/shameless/Old MBenze with new name. Dont know whether to laugh or to cry, ironically BRIM is the only "dedak" the Malaysia Baharu managed to dole out. Others might not even go onto the conveyor belt. Waa waa waa! Your boss had cash and jewelry over $1b....not reporting ah? One month already you are missing?